Eight is the number of different covers you will find on a souvenir edition of the Radio Times, commemorating the upcoming Live 8 concert. U2 are among the artists to garner their own cover of the publication, which will be available on newstands in the UK next Tuesday (28 June). 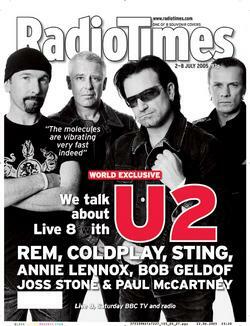 Inside the magazine, U2 are interviewed in a 10-page feature. Other artists with their own cover and featured inside are Coldplay, Paul McCartney, Sting, Bob Geldof, Annie Lennox, REM, and Joss Stone. Fans outside the UK who wish to order a copy of the magazine may contact Radio Times’ reader services by calling 08706084455 next week. Wow – nice pic – Bono looks exceptionally gorgeous as usual – but I wonder if Larry objected to having the 93p on his head !!!!!!!!! Did you notice where they placed the mailing label? i love it when Bono wears his angry face. wtf did they do to edge’s beard?